A collection of All-Star vocalists who have performed on stages throughout the world, each with a unique personality and sound, who have come together to form an amazing vocal experience that must be seen AND heard. With over a decade of experience performing for high level clients such as McDonalds, IBM, Walmart, The Walt Disney Company, Universal Studios, and more, our members combine to bring an unmatched level of ease, professionalism, and performance to every event. We believe your audience deserves the best. We believe the audience is looking for something fresh and engaging. We believe in treating every audience like it is our only audience. We believe that quality matters. We believe in doing our best to make your budget work. We believe in doing everything on stage and behind the scenes to make your event a success, based on expectations. The Edge Effect will provide that “WOW!” moment for your audiences with audience interaction, energetic performances, a diverse song-list, and customizable content. We guarantee your audience will leave your event clapping and smiling. 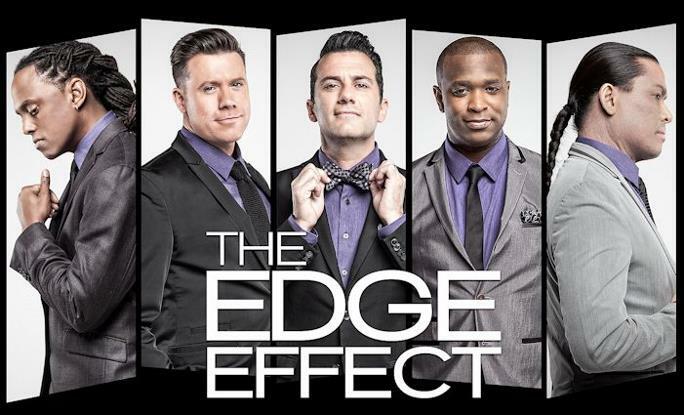 With huge name recognition due to extensive performances on cruise ships, The Edge Effect is poised to draw an audience to your venue. The Daily Buzz said they are “Absolutely Incredible” and the Orlando Sentinel calls them “A Must See!” event.